If you haven’t already noticed, I am a HUGE football fan and therefore incredibly excited for this weekend’s Super Bowl. In honor of the upcoming match up between the Green Bay Packers and Pittsburgh Steelers, I have decided to have a Souper Bowl. Like football, I also love soup. I thought this play on words would be a great excuse to create a soup that represents each team. I will start with the Green Bay Packers. 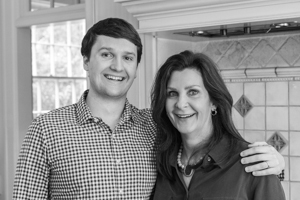 During my four years in Madison, I developed a connection with the Green Bay Packers. Growing up, I had heard of the cheese heads, the frozen tundra of Lambeau field, and the legend of Vince Lombardi. In 1997, I watched as the Green Bay Packers beat my Carolina Panthers in the NFC Championship game and went on to win the Super Bowl. 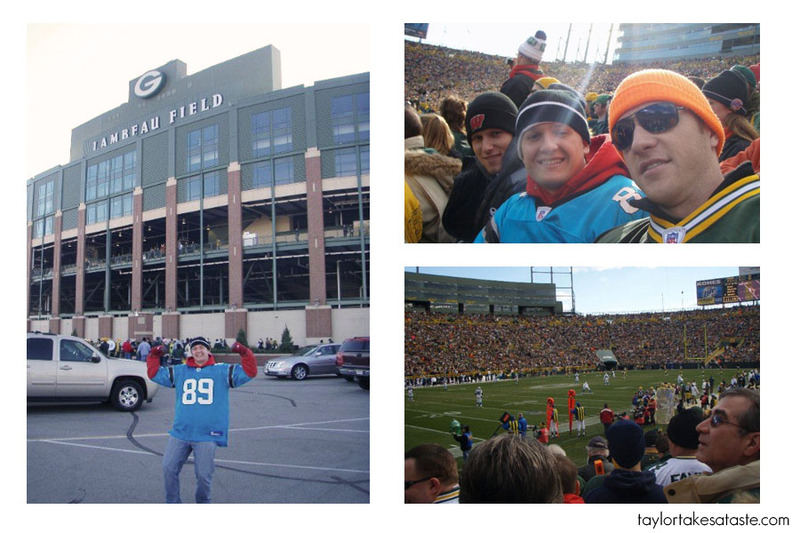 I was only 11 at the time, but little did I know that one day I would make my own trip to Lambeau for a Packers vs. Panthers game. During Brett Favre’s last season in Green Bay, I watched (yes I was wearing a Panthers Jersey) as the Packers once again dismantled the Panthers. Despite the loss on the field, I walked away with one of the best sports experiences of my life. I have been to the Olympics, tailgated across the country, and been to a Final Four, but watching a game at Lambeau Field still ranks at the top of my best sporing experiences. A game at Lambeau field is truly an experience any NFL fan would love! Packer fans are as passionate as any fan base out there. You have to be somewhat crazy to watch a game outdoors when it it is 15 degrees outside. This article pretty much sums up the literally “die hard” mentality of Packer Fans. To celebrate the Packers making the Super Bowl and my Souper Bowl, there was only one soup that would work. Beer, Bacon and Cheese. I love beer, bacon, and cheese independently, but add them together and you have created something special. My favorite bar in Madison had a beer and bacon night. 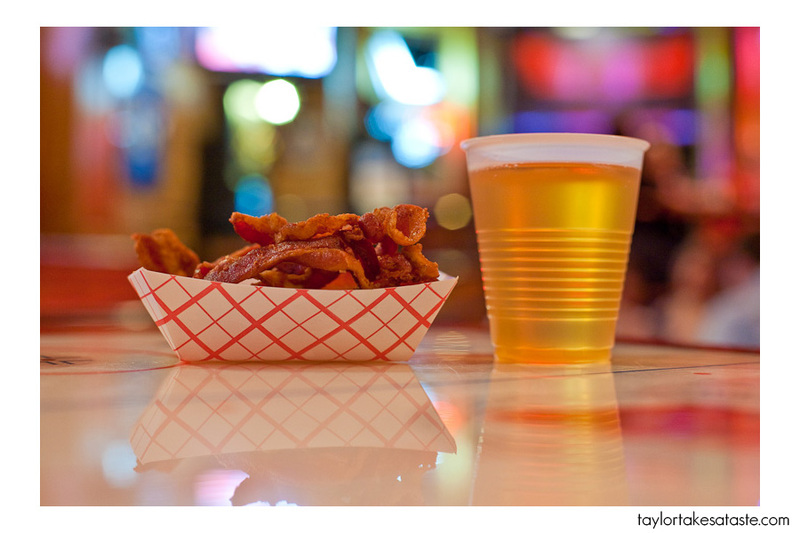 On Tuesday nights you could get free bacon and $1 beers. With that combination it was hard to go wrong. Beer and Bacon night taught me that Pabst Blue Ribbon paired well with bacon, so naturally PBR was the beer of choice for this soup. When choosing the cheese for the soup, I decided to go with a sharp Wisconsin Cheddar and a Colby Jack. After all, Colby cheese was invented outside Colby Wisconsin. 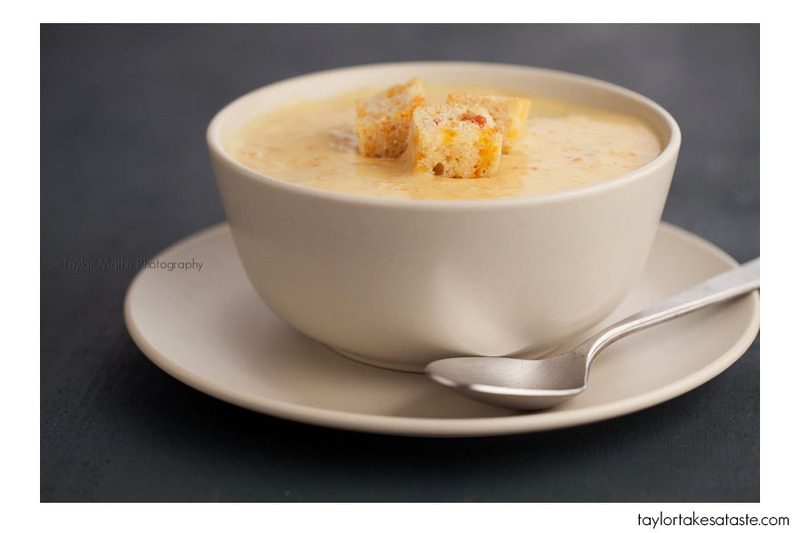 Here is the Recipe for my Beer Bacon and Cheese Soup. Place butter and garlic in a large pot over medium heat. Stir butter and garlic until all butter is melted. Add onions, carrots, and celery. Cook about 5-10 minutes until vegetables are tender. Add flour and stir for 3 minutes. Continue stirring, while slowly adding the beer and chicken stock. Bring to a boil. I like my soup somewhat chunky, but if you like a smoother soup, at this step use a blender to puree the soup. On very low heat add the cream, cheese and spices. Make sure the heat is on low, if it is too high, it will cause the dairy to break down. Serve in a bowl or bread bowl with Croutons or additional bacon pieces. As you can see, I garnished mine with croutons. These are not you average croutons. In continuing with the bacon, beer, and cheese theme, I made bacon cheddar beer bread croutons. Here is the recipe for my bacon, cheddar, beer bread. In a large bowl, combine the above ingredients. Stir until a think dough has formed. In a greased loaf pan bake for 55 minutes at 375. 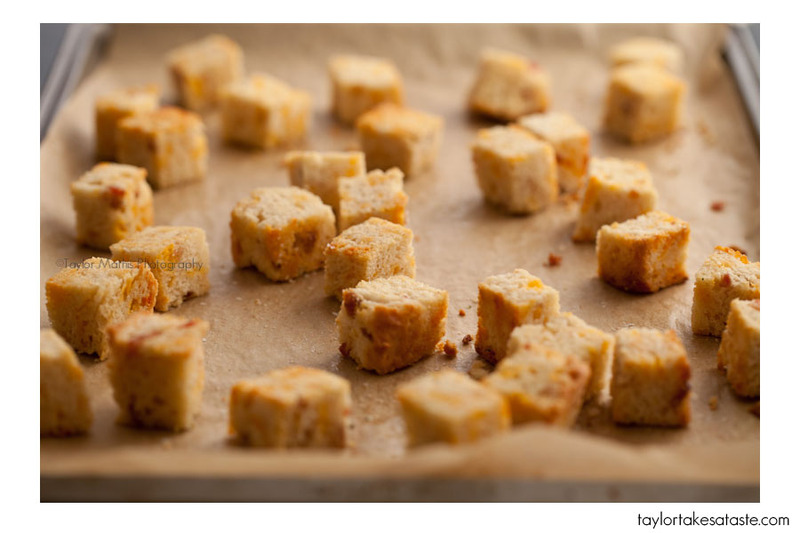 To make the croutons, wait until the bread has cooled. Remove the crusts from the sides, top, and bottom. Cut the bread into bite size cubes. Brush cubes with butter and cook for 15-20 minutes at 350F. They are done when slightly brown. Sorry Steeler fans, but I will be cheering for the packers come super bowl time! Later in the week I will share with you my soup inspired by the Pittsburgh Steelers. « National Blueberry Pancake Day! def a superbowl dish for me to try, love the homemade croutons, i am sure your friends love that you take that extra step and I’m sure it makes it taste incredible! Go Pack! I’m originally from Wisconsin, but now live in North Carolina, so I can appreciate your Packer/Panther love. This looks fantastic, and I can’t wait to try it. Kudos on using a Wisconsin beer too! Hi Taylor. Just bumped into your site. Wow! 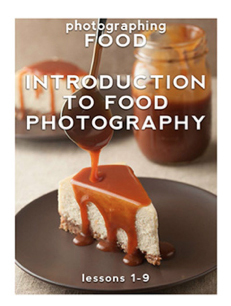 Great stuff and incredible photos. And that soup….looks amazing. Thanks Mike! I am glad you found the site and enjoyed it! outstanding!!! Can’t wait to make it and can’t wait to see what you make for the packers! WOW- this soup is going with me to our Super Bowl party – I can tell my just reading the recipe that it is going to be a great hit . 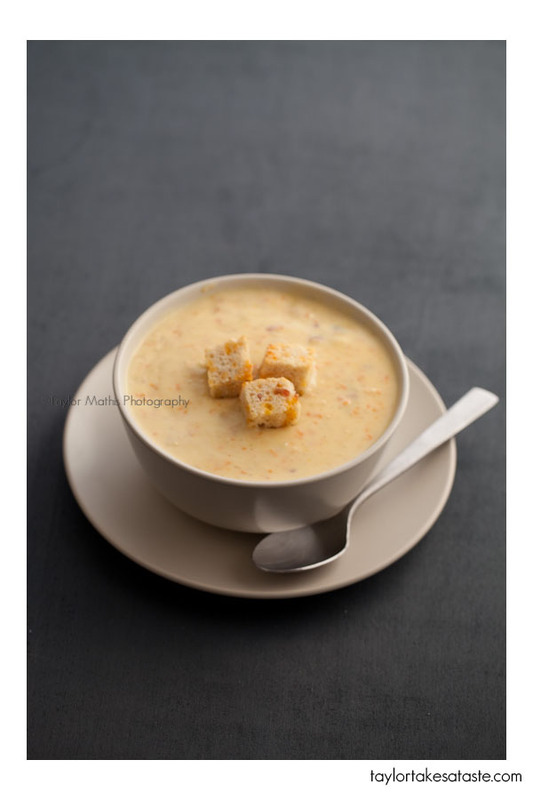 . . How can anyone go wrong with cheese and bacon soup topped with cheese and bacon croutons! Thanks for sharing it with us Taylor! Great photo! And I really want to try this soon! I may just have to make a big batch for Superbowl! Hey Taylor, why not put out the Pittsburgh Steelers Soup Receipt on the board! Everyone will be starting evern Packers & Steelers. I would like to make both and not let anyone know which one they are eating and than we would have a winner for the soups and and winner on the field or both….Come On let’s have the Pittsburgh Soup Receipt……….Putting it next week, well want be not FUN!…..We will have Packer and Steeler fans over at the house for the EATS…and the GAME……..Looking forward to seeing the receipt……………..
i was wondering, since we are veg, would this still be tasty without the bacon?? I found this recipe on Pinterest, can’t wait to try it!! I also went to Madison and bacon night was my favorite (what I can remember of it…). Ooh Wandos.